China has detained five people as part of its probe into a firm that allegedly supplied out of date meat to fast food chains, including McDonald's and KFC. State-owned Xinhua news agency said the five were held by the Shanghai police, but did not give any further details. Chinese regulators suspended operations of Shanghai Husi Food earlier this week after reports in local media claimed it re-processed expired meat. 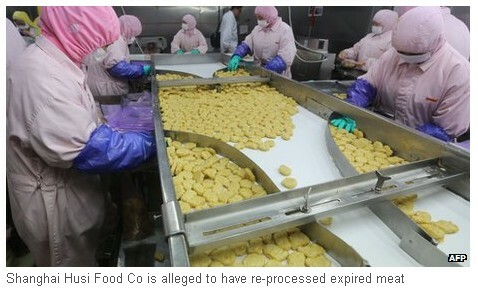 It the latest in a series of food scandals to hit China in recent years. The allegations against the firm were levelled by a news programme aired by Shanghai-based Dragon TV on Sunday. On Tuesday, Xinhua reported that Zhang Hui, manager of Husi's quality department, had revealed during investigations that "such meat had been produced under tacit approval of the company's senior managers". McDonald's and KFC have issued statements saying said they had stopped using meat from the firm. The scandal is a fresh setback for Yum Brands - owner of KFC and Pizza Hut - which is trying to rebuild its image in China, one of its biggest markets. Yum's sales in China dipped after a report in 2012 said two of its suppliers were providing chickens with excessive levels of antibiotics. But the company had started to bounce back and reported a 9% jump in sales at its outlets in China for in the three months to 22 March. Sales at its KFC outlets in the country rose by 11% during the period. The food safety scare has also spread to Japan, and affected two companies there, including McDonald's. The fast food chain operator said about 20% of its chicken nuggets sold in Japan came from Shanghai Husi. And a Japanese convenience store operator, FamilyMart, said its 'Garlic Nugget' imported from the Shanghai firm was sold at nearly all of its 10,000 outlets across Japan. Both companies said they have stopped using meat purchased from the Shanghai supplier. In the case of McDonald's in Japan, nearly 500 stores have removed chicken nuggets from their menu. Sales are expected to resume later this week, when the fast food chain switches to other suppliers in China and Thailand.